For me, Broadway Market is the best gluten free market in London! 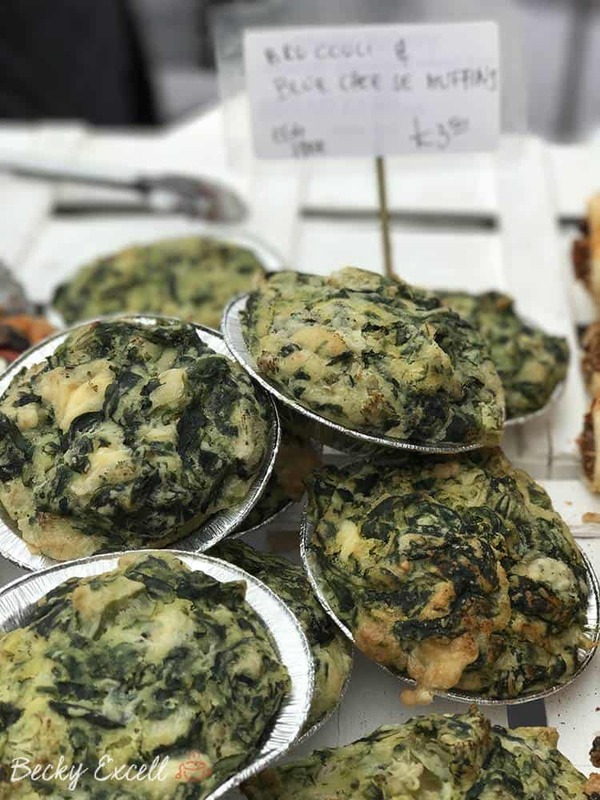 The market is on every Saturday in Hackney, East London – right near London Fields station. I’ve recently fallen in love with Broadway Market. I love London food markets, but obviously for a food market to be good it needs to have lots of gluten free offering! Fortunately for us, it’s got everything from gluten free and dairy free donuts to Scotch eggs. Here’s my fave places to eat there! I’ve heard good things about Broadway Market for a long time now, but only in 2017 did we venture there for the first time. It’s easy to get to, practically having an Overground stop on it’s door step. Or, if you fancy a stroll, we have walked there a few times from Liverpool Street too. 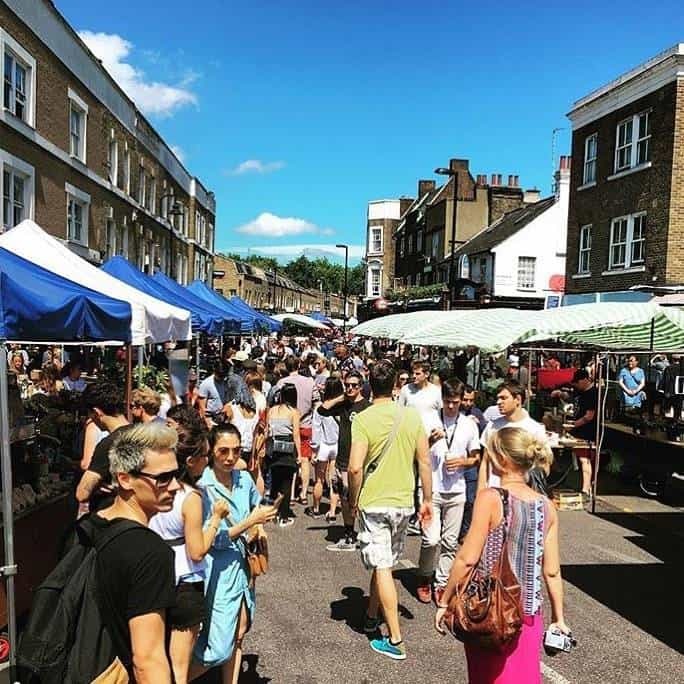 Broadway Market’s street market is on every single Saturday from 9am – 5pm. During the rest of the week, there are plenty of shops and restaurants to enjoy along the street too. 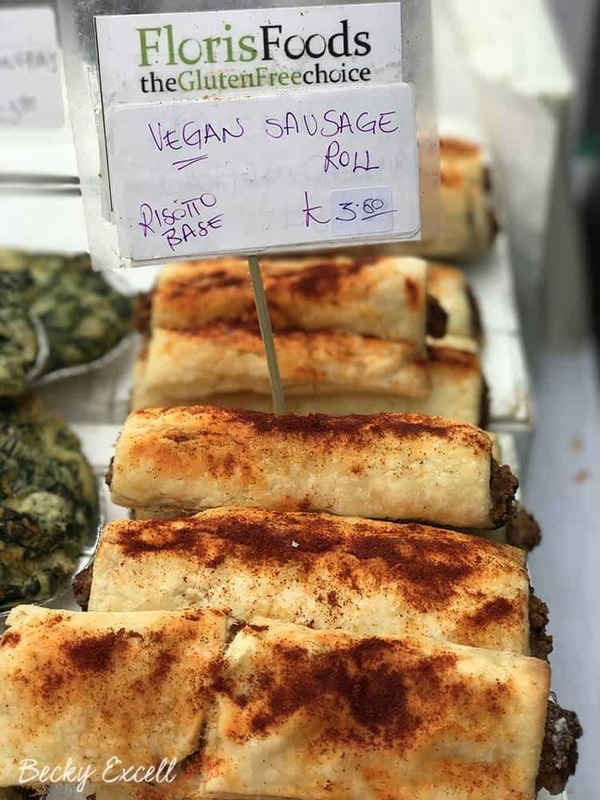 There is such a variety of cuisines across the market and London Fields is just across the way for you to sit in and enjoy your gluten free foodie purchases. I thought I would highlight a few of the stands not to be missed by anyone, especially those on the hunt for gluten free. 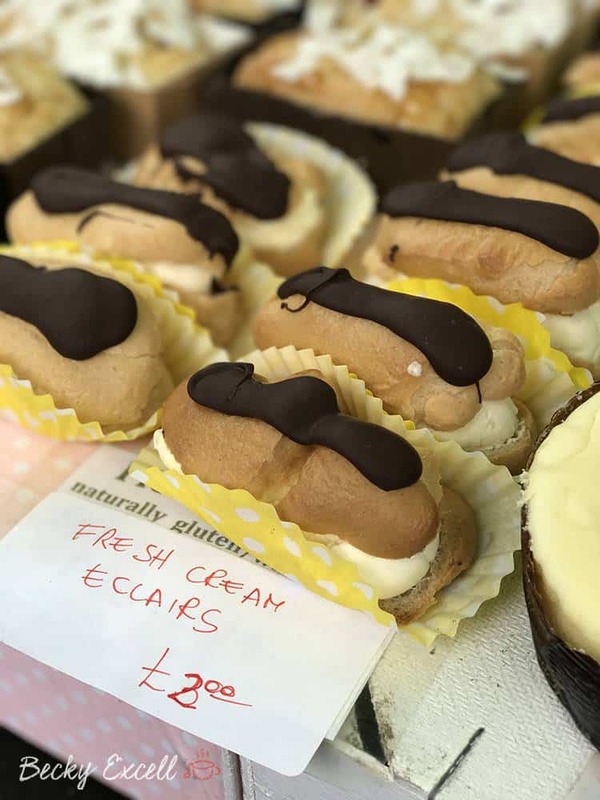 These are my favourite gluten free places at Broadway Market! I would literally go to Broadway Market just for Floris Foods. It is 100% gluten free and has a whole host of dairy free options every single time I visit too. They do both sweet and savoury options so whatever you fancy, there will be something for you. We always end up taking a bag of goodies home with us on the train! My favourite item across the entirety of Broadway Market comes from Floris Foods – their gluten free and dairy free doughnuts. I’m pretty confident that most people reading this have probably tried some sort of doughnut in their gluten free life. But if you haven’t had a Floris Foods gluten free doughnut, then you seriously haven’t lived. They smell like the doughnuts you’ve been yearning for, as well as being light and fluffy with that all important heavenly filling in the centre. Each doughnut has filling oozing out, many of which are also dairy free. 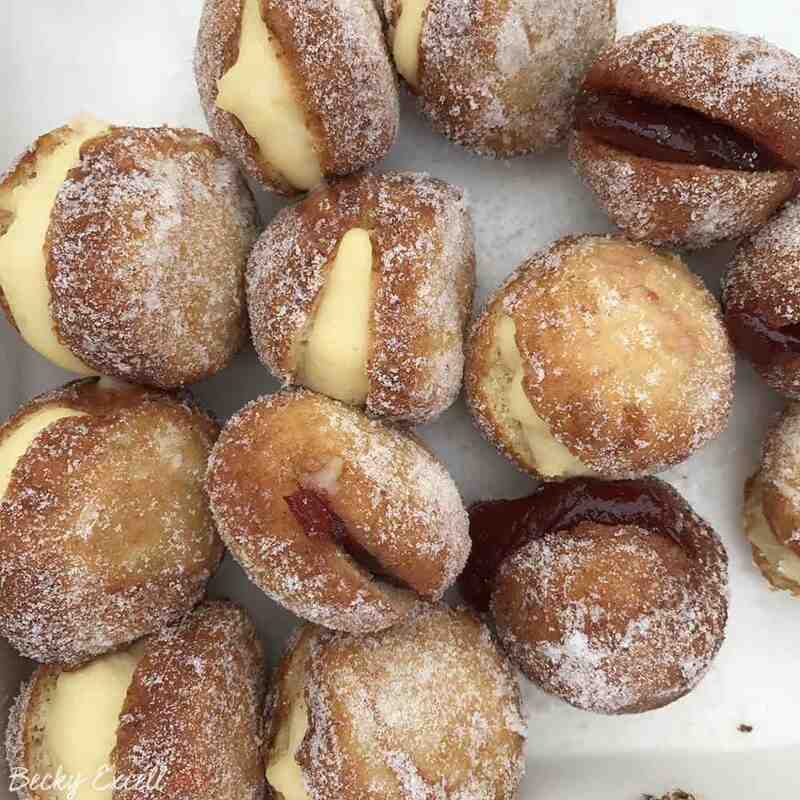 There’s gluten free jam doughnuts, gluten free custard doughnuts, gluten free chocolate doughnuts, gluten free fresh cream doughnuts and even peanut butter & jam doughnuts. Need I say more? I could literally write an entire blog post just on these particular balls of joy! But that’s not all folks! 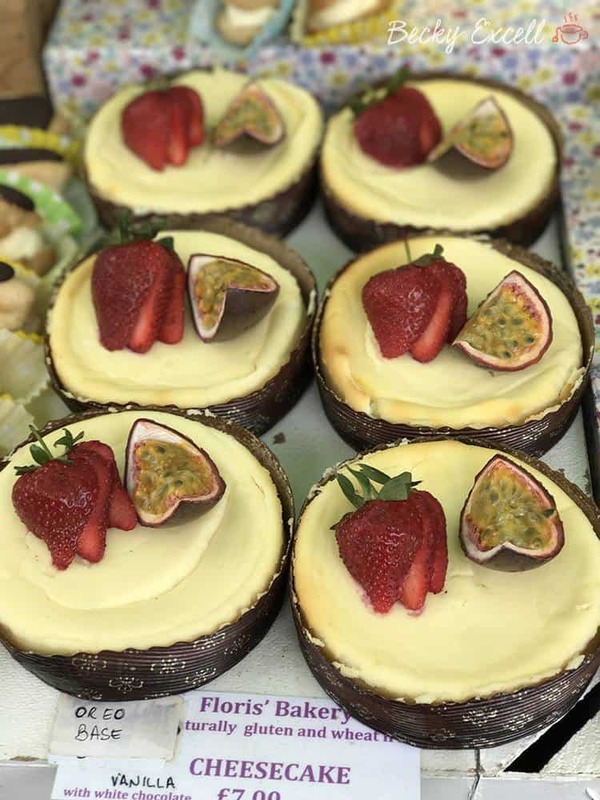 Floris Foods also does the most amazing gluten free chocolate eclairs, gluten free cinnamon buns, homemade gluten free Oreos (with again a variety of fillings) and out of this world gluten free cheesecakes. Again, nothing you have tried anywhere else will compare. They really do make those items that all gluten free folk have been craving and struggling to find, but so much better than everyone else. Of course, they also offer a whole host of gluten free and dairy free cakes too. In terms of savoury, Floris Foods bake their own gluten free bread which they sell fresh each Saturday. As well as this, they serve up gluten free savoury muffins, scones, filled focaccia (the ham, ricotta and tomato one is dreamy), breadsticks, pizza bases and vegan sausage rolls, to name but a few. So yes, Floris Foods is the one! If you are gluten free, eat everything!! If you are dairy free, what you can eat is very well labelled and the lady who runs the stall is also very helpful. 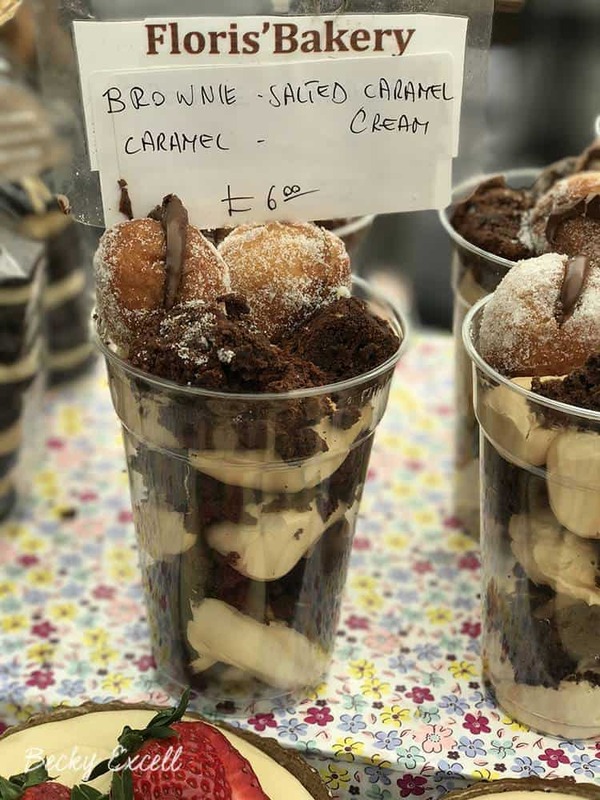 I would definitely make this your first stop of the day at Broadway Market = don’t let anyone else eat your share of those gluten free doughnuts! Phew… and that’s just one out of six places on my list! Eat ‘n’ Mess is another place that you should never miss out on whilst visiting Broadway Market. 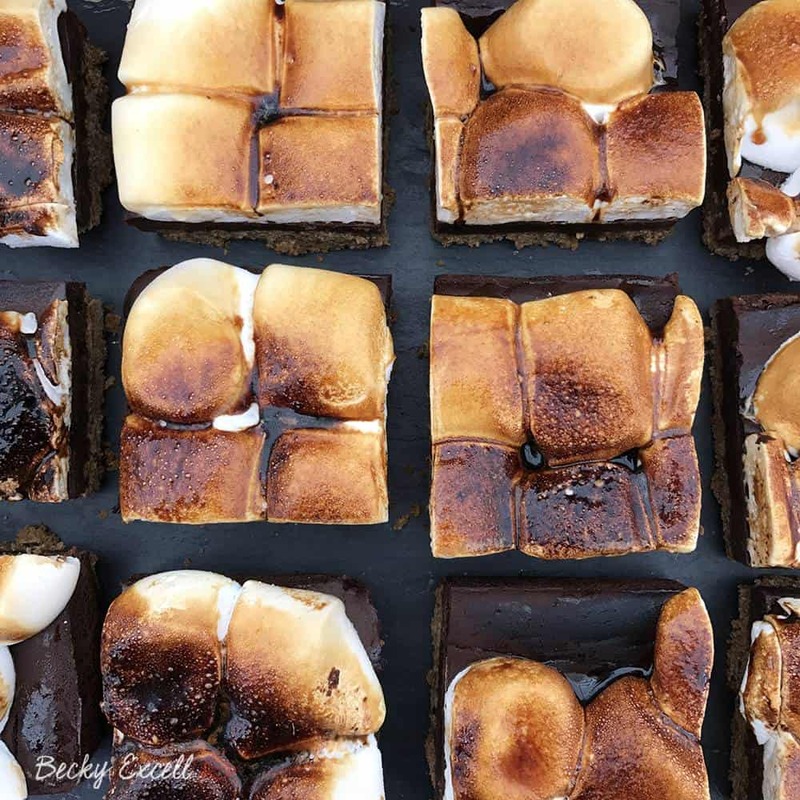 They have an incredible selection of freshly baked gluten free goods that are to die for. Again, this is another place that we always go to and always come away with a care package of gluten free cakes and bakes! As with Floris Foods, I definitely have my favourite item from Eat ‘n’ Mess. 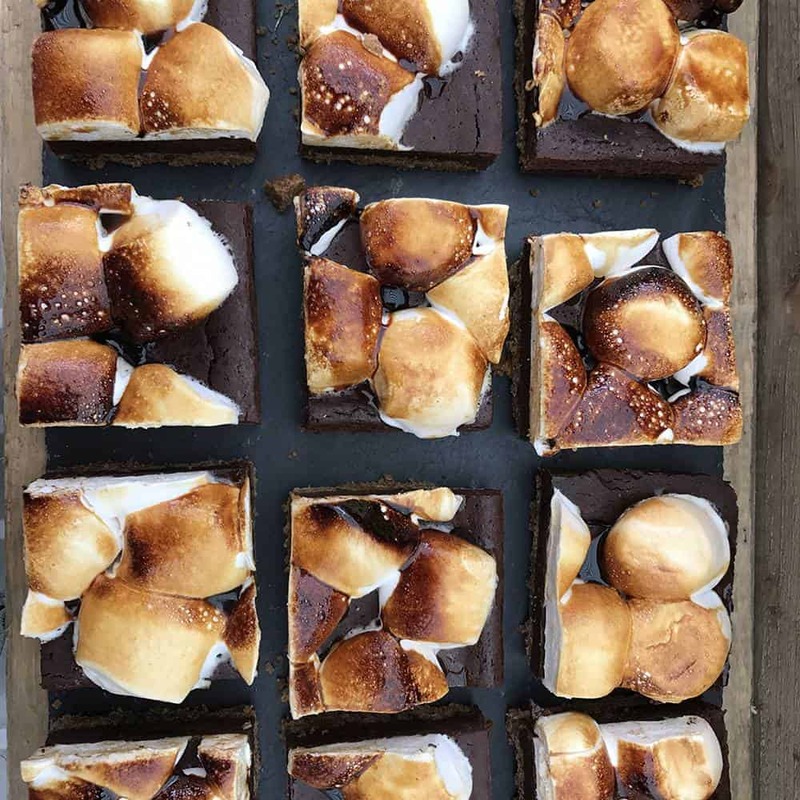 The gluten free S’mores chocolate cheesecake brownies are phenomenal… oh my the biscuity base… and chocolate with marshmallow is simply a beautiful combination. 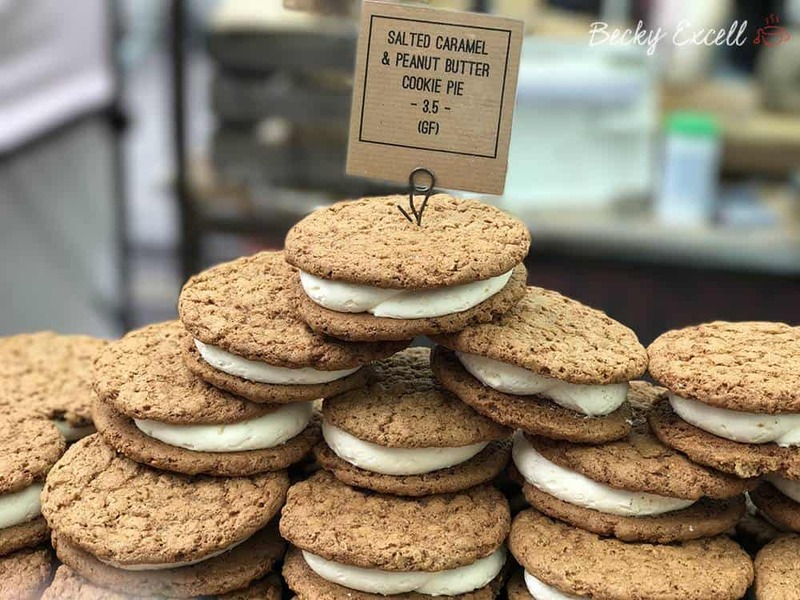 Another must try from Eat ‘n’ Mess is their gluten free Cookie Pies! I mean… just the name is enough to make you want one right?! 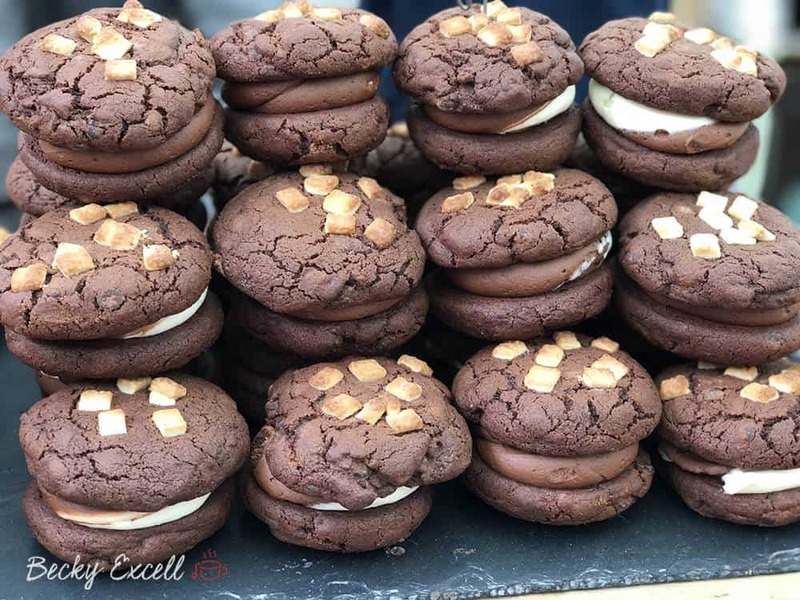 I really like the salted caramel and peanut butter cookie pies but they also do double chocolate cookie pies which look insane. 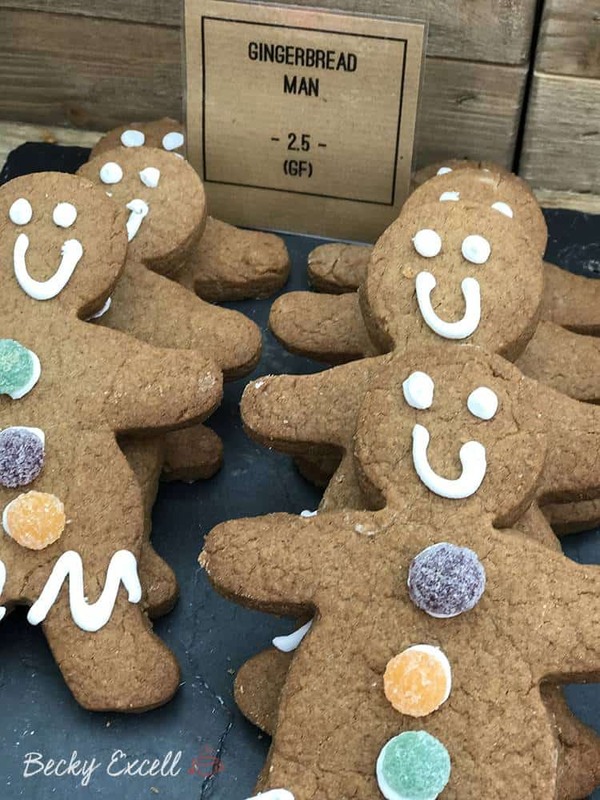 Their gluten free brownies, gingerbread men, loaf cakes are equally delicious too. 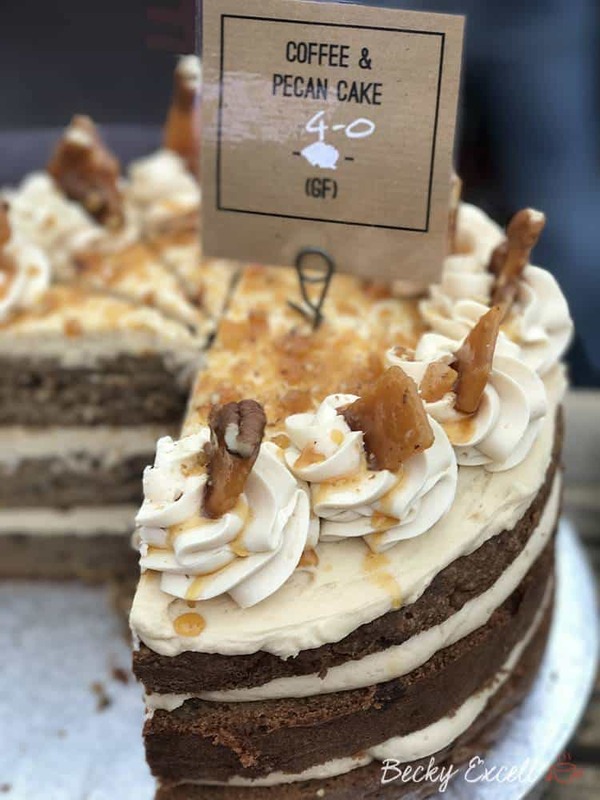 If you’re partial to coffee cake like me, their gluten free coffee and pecan cake will definitely be going home with you! On a side note, Eat ‘n’ Mess do in fact have their own shop/cafe however it is not based in London, it’s situated in Sevenoaks. That’s where they bake all their cakes and fresh bread, but you can also enjoy a sit down with some tea and gluten free cake there too. Oh and one final thing about Eat ‘n’ Mess is that they can make bespoke cakes for special occasions. If you haven’t had a look, check them out on their Instagram or website as they are amazing! Gluten free onion bhajis anyone? I have wandered past Gujarati Rasoi on many occasions at Broadway Market. Having already eaten my body weight in gluten free doughnuts, I usually never got around to trying anything. Until now! 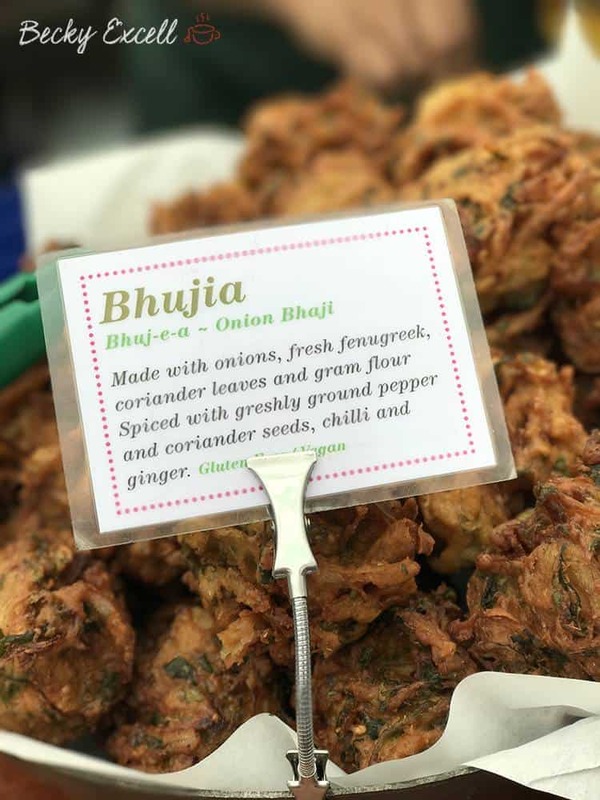 I’ve always been drawn to their stall due to the most amazing aromas of Indian cooking and when I went up and had a look at what was actually cooking, I was even more excited. So many of their dishes are gluten free (clearly labelled) and I even found Indian dishes here that were low FODMAP with no onions or garlic – result!! 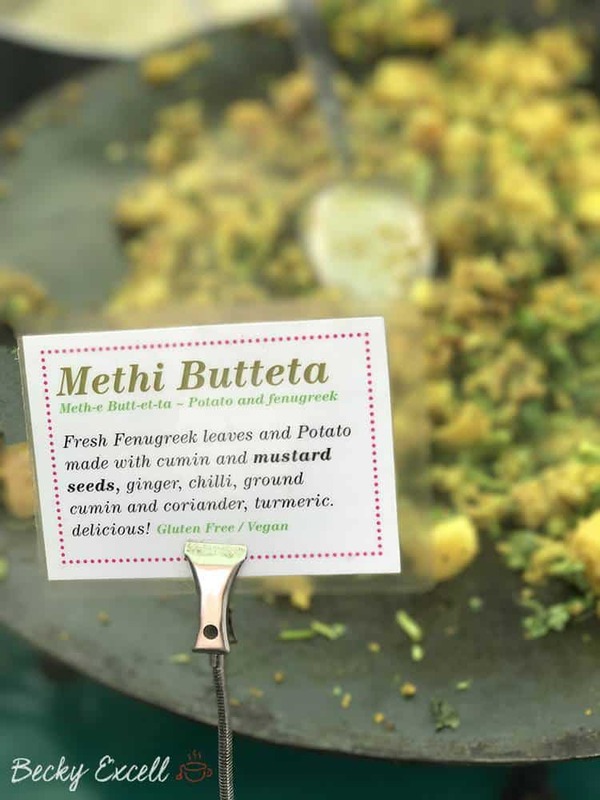 The Methi Butteta is an Indian potato dish which I absolutely love! These guys seriously know what they are doing and you can tell how much everyone loves their food just by the massive queues. 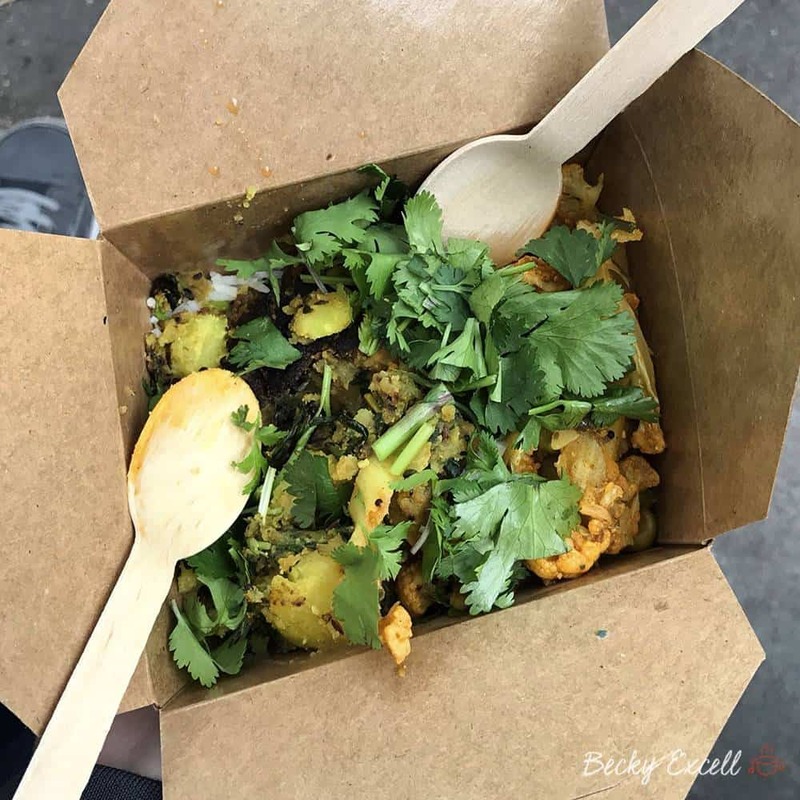 The Methi Butteta alongside some rice is now my go to lunch at Broadway Market, it is the most magical blend of spices that I know you will love too. For those who can eat onion, they do what looks to be the most insane gluten free onion bhajis too! 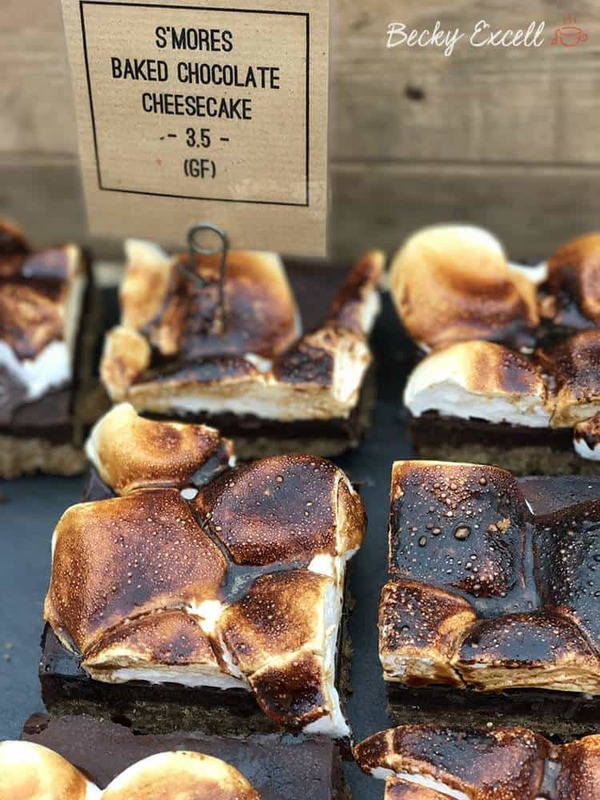 They do also have a stall at Borough Market (six days a week) and they even have their own restaurant in Dalston that you might like to visit… we certainly will at some point soon! The wonderful Finest Fayre brought me my very first taste of Broadway Market a few months ago. 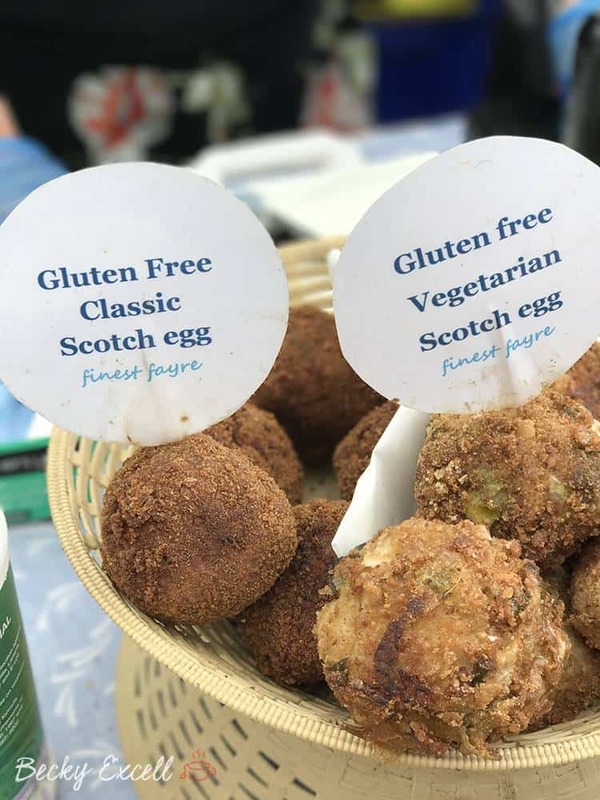 It was the stall we arrived at first and we were amazed by what we saw in front of us… gluten free scotch eggs. 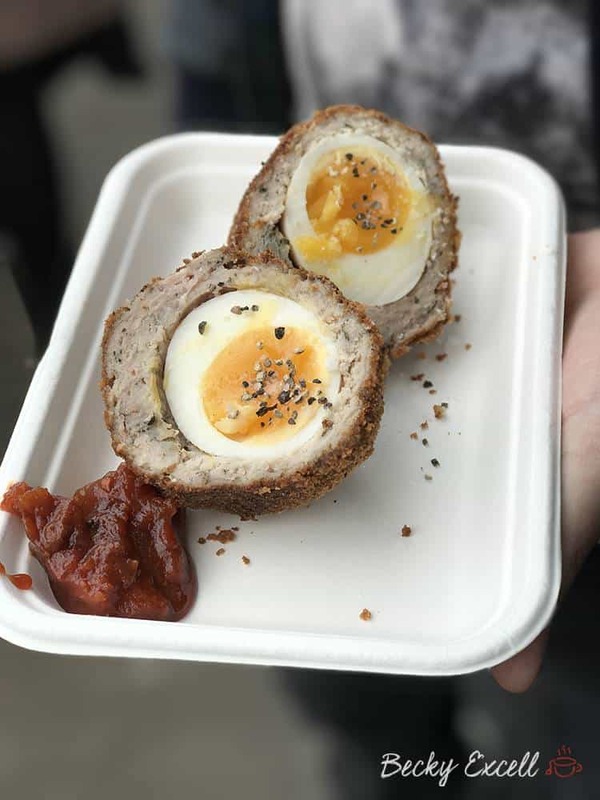 But these aren’t just any gluten free scotch eggs… these are handmade beauties with an oozing yolk. I had mine served open, seasoned and served with a little relish, scrummy! They also do vegetarian gluten free scotch eggs which looked equally amazing! 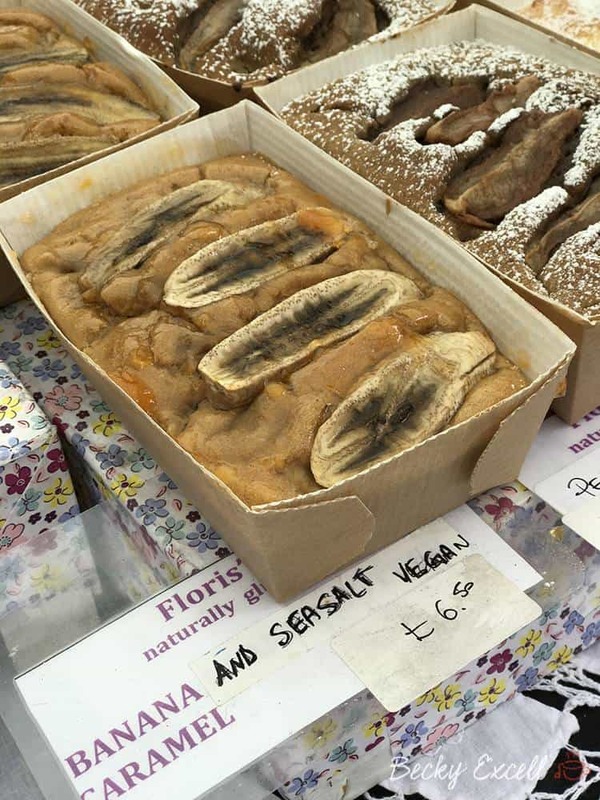 This is probably the most attractive stall at Broadway Market and it’s definitely one for us gluten free folks! 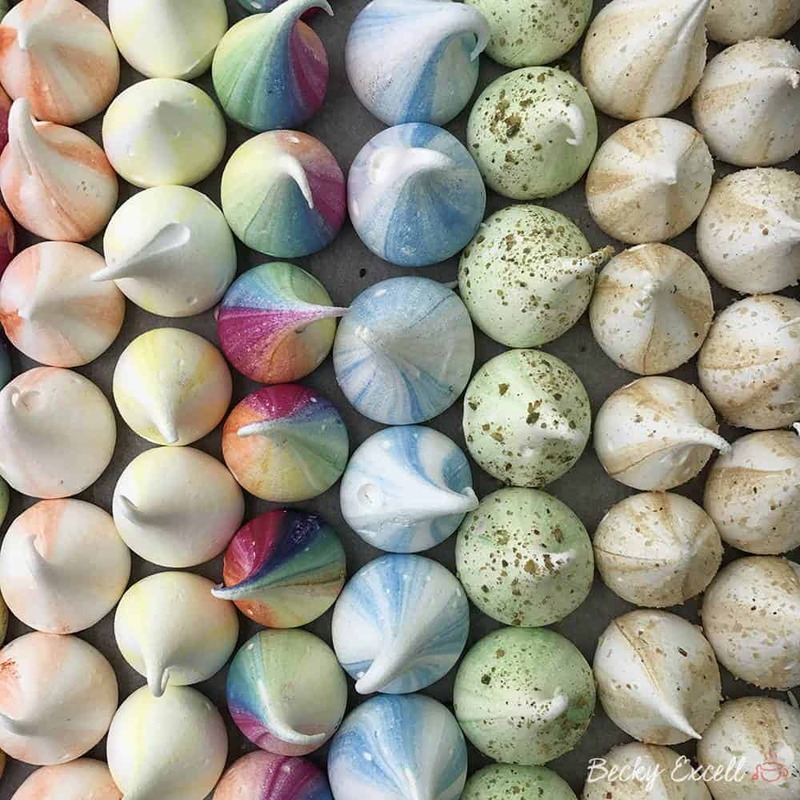 As the name suggests, Meringue Girls make the most amazing… meringues! They are bright and beautiful with only natural flavours and colourings – it’s amazing when you think about it. 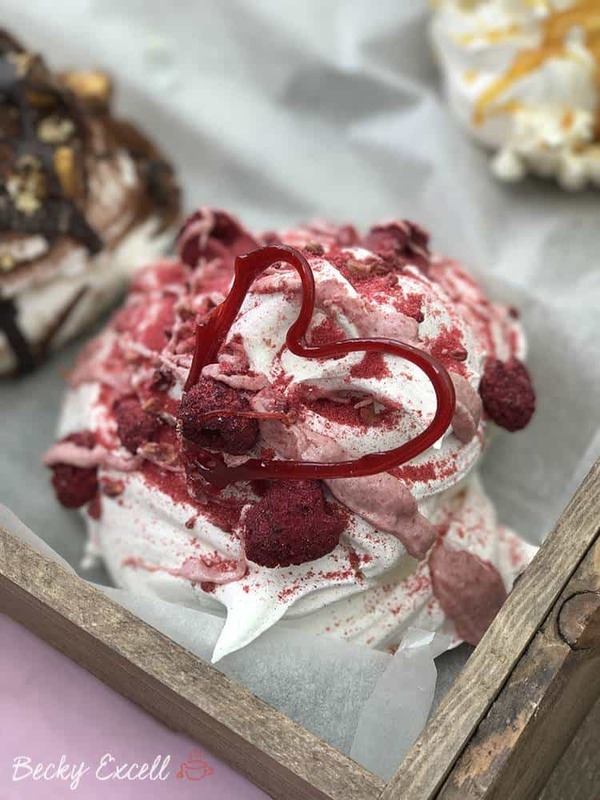 They also serve up delicious mini pavlovas, and sometimes meringue-topped gluten free brownies! 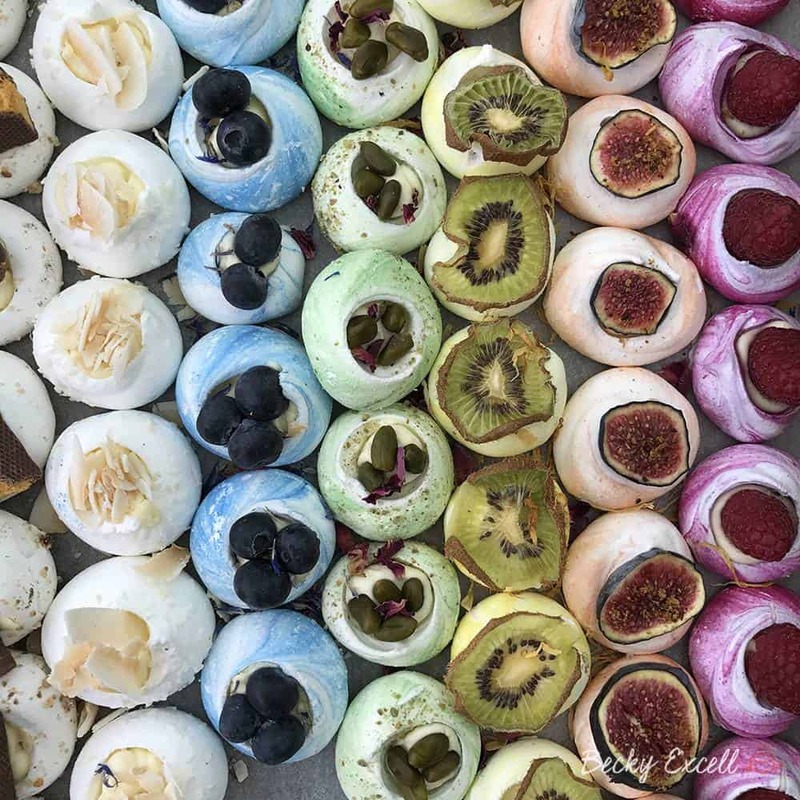 The Meringue Girls stall is a magical place you should definitely check out – you can’t miss it! I thought I would mention a non-market stall in this post as well. 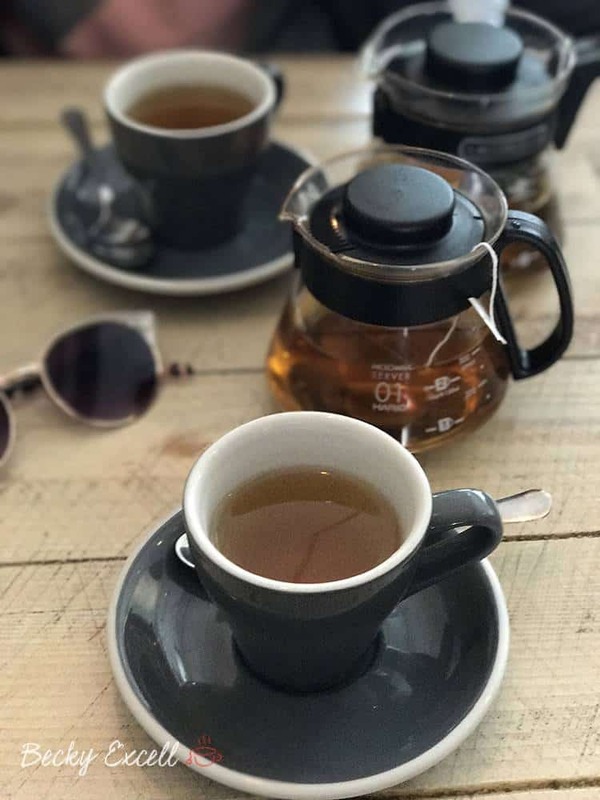 Whilst on a Saturday you generally go to Broadway Market for all the stalls, some of the resident shops and restaurants on the outside are equally worth a visit. My favourite place to get some gluten free grub and a nice drink is The Bach. It’s a Kiwi joint which has great food and atmosphere in equal measures. 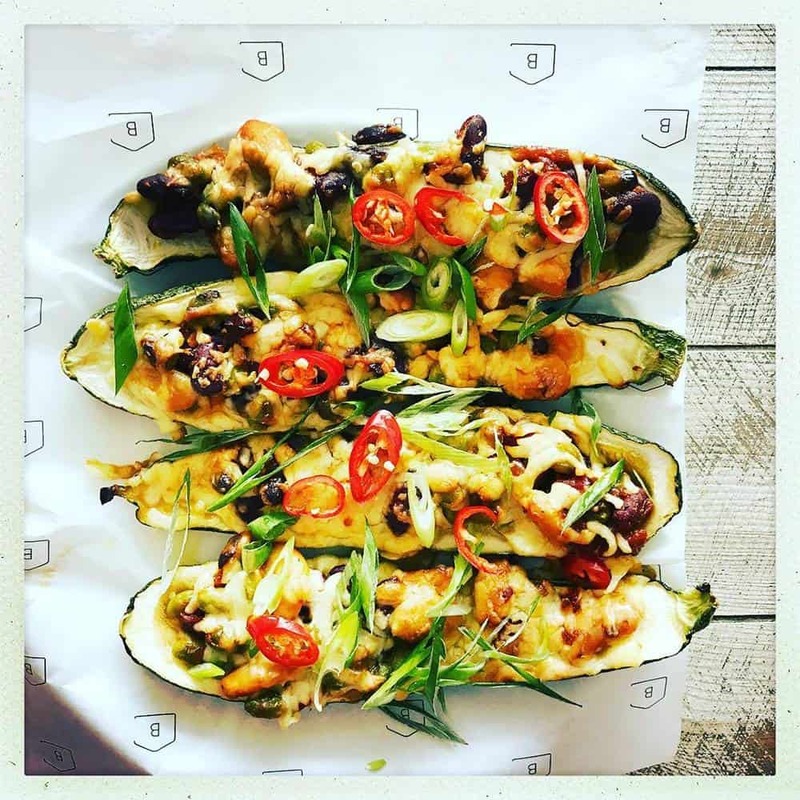 Plus, they fully understand intolerances to gluten, dairy and wheat as well as providing vegan and vegetarian options. Food wise, there are lots of gluten free options. They offer gluten free bread so you’ve got a healthy amount of brunch and lunch dishes available to you. They also often have a good selection of gluten free cakes. The Bach I think is one of the best places in the area to just sit and chill out with a drink and a book/laptop, it’s just got such a cool vibe. Downstairs they have what looks like the coolest desk space that you can rent out – I only wish I could afford it! So that’s that! 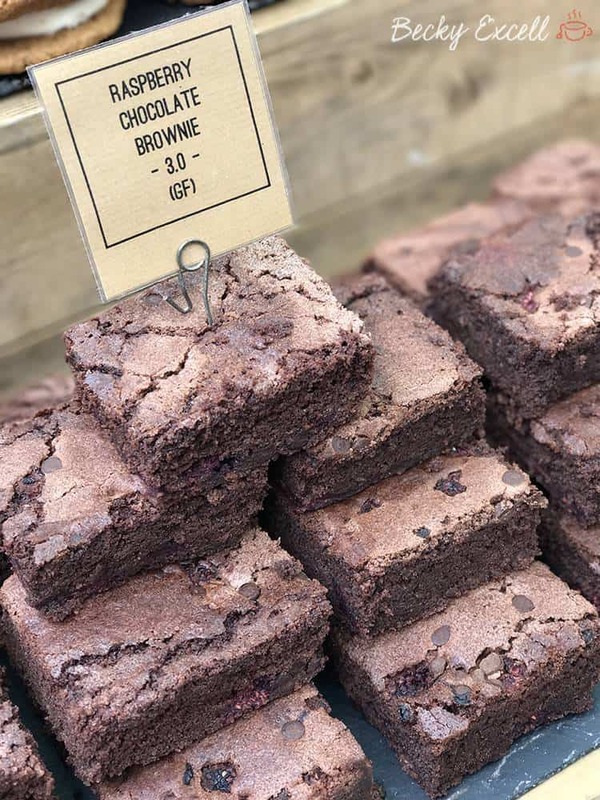 A little guide to my greatest gluten free hits at Broadway Market. There are actually a whole host of more places that I always notice have gluten free signs up, however I haven’t yet had the chance to try them. To be honest, the places I’ve put above are literally all you will need, otherwise you won’t be able to get home… food overload! For me, Broadway Market is certainly the best gluten free market in London. It offers us gluten free folk so much choice and some 100% gluten free stalls too. I would just say, always be super careful at markets just because with the tight space that the stalls have, cross contamination could be possible. But all the stall holders are incredibly friendly and clued up on allergens, so you shouldn’t have a problem! Let me know if you get down to Broadway Market to experience the gluten free offerings it has. 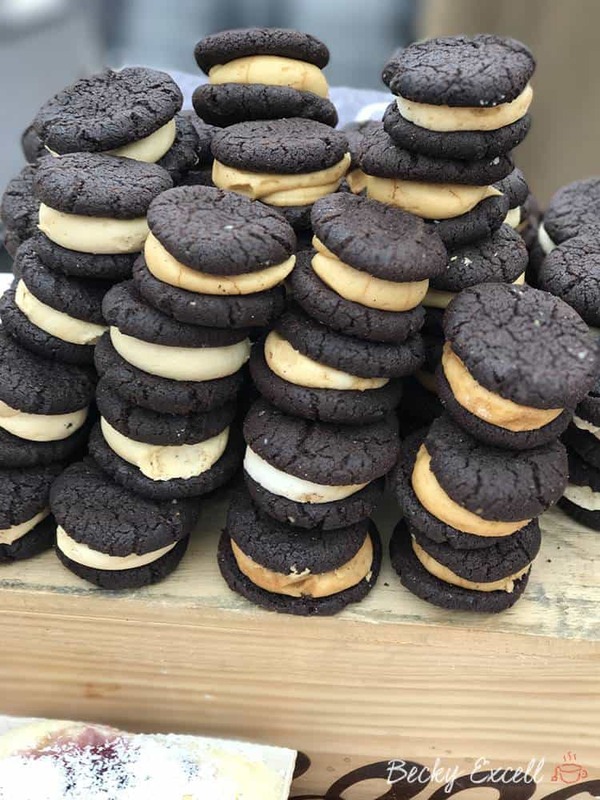 If you get great gluten free food from other market stalls there or if new stalls pop up, just drop a comment below and let me know (or on Facebook / Twitter / Instagram)! Thanks for reading and happy gluten free market exploring!